Guerlain Habit Rouge EDP 100ml. Guerlain Habit Rouge EDP transcribes the brazen sensuality of men of conviction, who bring out the sensations in every instant of life. 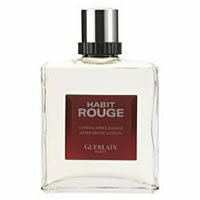 Guerlain Habit Rouge EDP is a rich oriental and woody aroma. With Guerlain Habit Rouge EDP disconver limette, orange and bergamot that quickly draws you into the spicy heart, enhancedby neroli and a rich vanilla base rounded by patchouli, soft leather notes and the tender sensuality of agarwood.